Situated on the shores of beautiful Port Stephens, Anchorage Port Stephens offers luxury seaside accommodation only two and a half hours drive north of Sydney. This Port Stephens accommodation features a choice of rooms and suites that have private balconies or verandahs with most boasting views of the sea, the Anchorage Marina and Corlette Beach. Guest can enjoy an extensive range of onsite recreational facilities, including onsite day spa, heated swimming pool. Located on the banks of the Myall River, Boathouse Resort Tea Gardens offers spacious accommodation close to Winda Woppa Reserve and Myall Park. Just minutes from the Hawks Nest Golf Club, the resort boasts a great range of onsite facilities and is close to a variety of popular local activities and attractions including Jimmy Beach Reserve, Bennets Beach, Koala Reserve, Fighter World and plenty of outdoor activities including kayaking, deep sea fishing and whale watching. Oaks Pacific Blue Resort is a luxury resort, offering guests Hotel and Studio Rooms, 1 & 2 Bedroom Apartments and 3 Bedroom apartments with private plunge pools. Salamander Bay is a water wonderland, located 30 minutes from Newcastle Airport or a 2 hour drive from Sydney. Here you will find a huge range of water sports, leisure and sightseeing activities to enjoy in the Port Stephens area on the NSW Coast. 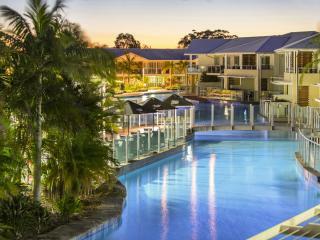 Located in beautiful Shoal Bay at the entrance to Port Stephens, Ramada Resort by Wyndham Shoal Bay offers self-catering accommodation with views of the Tomaree volcanic headland and pristine sands. Close to the airport and just a couple of hours from Sydney, the resort boasts an outstanding range of onsite facilities and is close to National Parks, bushland, crystal waterways, Nelson Head Lighthouse, Myall Park, Winda Woppa Reserve and a number of other local activities and attractions.